As you may have seen in a previous post on the blog, I bought an old Atari 2600 a while back. It came with two sticks. One looked in better condition then the other, however while it may have looked better, it was actually a lot worse then it looked in terms of play-ability. After a few rounds of River Raid, I found having to push extremely heavily to get a reaction out of the game indicated that perhaps the contacts in the joystick had worn down... With these old devices, its basically a set of little metal 'clickers' (best description I can think, though I'm sure there's an official name for them) that push down and make contact in a circuit - and when these lose their conductivity - well, that's when you die in River Raid, more times then you would like to! So - I decided that perhaps one way to make sure I show everybody my true River Raid expertise would be to fix up those unreliable contacts... And what better way could there be then replacing tired old technology with modern micro switches. 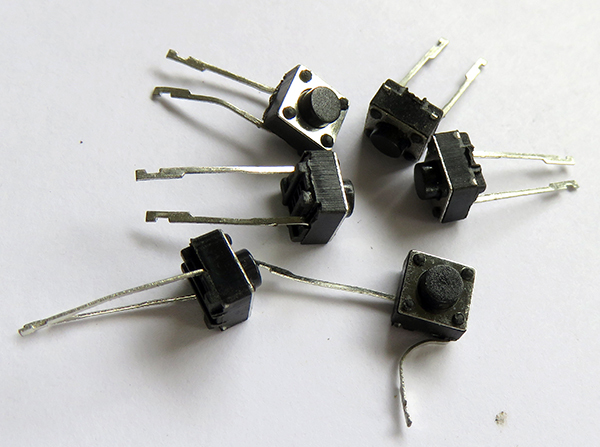 I went ahead and ordered some micro-switches from Aliexpress. They cost US$1.15 (free shipping) for a bag of 50. Locally here in NZ, these can sell for NZ$0.50 each, so I definitely made a better choice spending my dollar and a half. 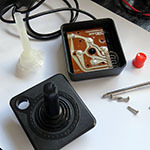 The Atari stick is a real doddle to open up - just 4 screws in the bottom. The only thing to watch out for was a small spring that sat below the fire button, but other then that its just a collection of plastic bits and nothing overly technical to worry about - especially when it comes to that "Heck! How do I put this back together!?" moment. Nice and simple... No crazy "springs-go-everywhere" panic here! The 2600 Vader model I believe was released in NZ around 1984-ish, making these around 32 years old. 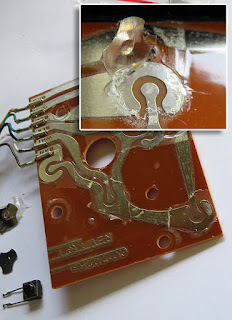 It was covered in dust, worn plastic and the plastic coating on the PCB was bubbling in places. What I needed to do was to lift the 5 metal clickers from the PCB... Like most joysticks of this era, these are usually held down with a plastic tape/adhesive cover - and in this case, the whole board was covered in one big sticky sheet. 32 year old dust... Ewww! With some careful craft-knife action, and a finger-nail I did pull away a lot of the plastic. I needed to ensure that I had plenty of track to solder my switches on as well. A little methylated spirits and cotton bud action, it was looking pretty clean and ready for the switches. It wasn't as easy to get these switches on as I'd first thought. Each switch is pretty tiny and I needed to make sure that the switches sat over that central point where the pad had been. Also, the legs needed to be bent about to match the tracks. 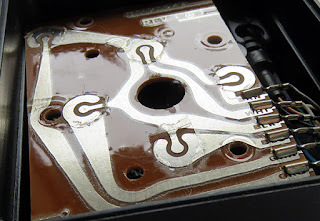 Holding buttons down on a smooth circuit board is tricky - they slip and slide about a little more then I'd liked. I could have glued them down first, but I didn't want to do that should I need to replace out one later on. 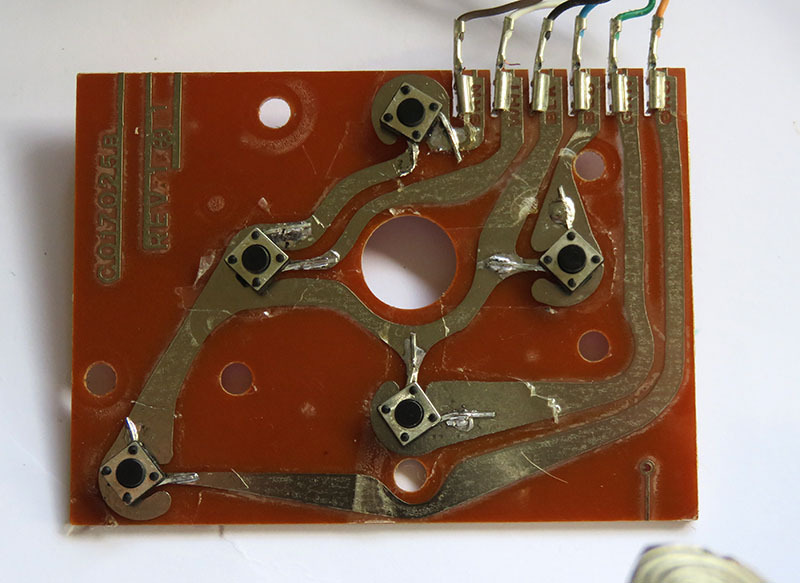 It took a handful of 'finger pressing' and careful maneuvering of a hot soldering iron to prevent melting my skin off as I soldered each one in place. Soldered on - ready to play... Almost! As I attached each individual switch, I felt I should really make sure that the switch works before carrying on to the next. I had an old app on my Samsung Tablet for testing gamepad diagnostics. There are plenty of tools for this - do a simple search on the Google play website - and its handy for such a project. Very cool USB adapter lets me use this on both Tablet and Pi! I did run across a couple of switches that didn't appear to work, and one that operated as though it was always on, and pressing down made it go off. Since I'd actually tested these switches with a multi-meter prior to soldering them in, I'm not sure why that's the case, though some I had held down when soldering. My only real guess here is that possibly the heat, combined with the depressed button could have caused damage to the switch... But it wasn't hard to just grab another! (Given there were 50 of them). I finally managed to solder all of them in. They sent appropriate on-off as expected through the tablet and I started to reconstruct the joystick. However there were a few things that I had to do before this would work. These had to be surgically removed. 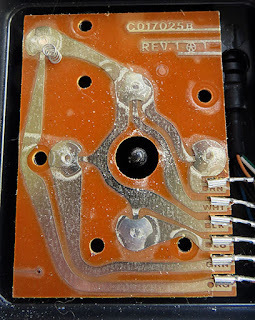 The main one were the pins on the joystick shaft that were designed to press down on the contacts. 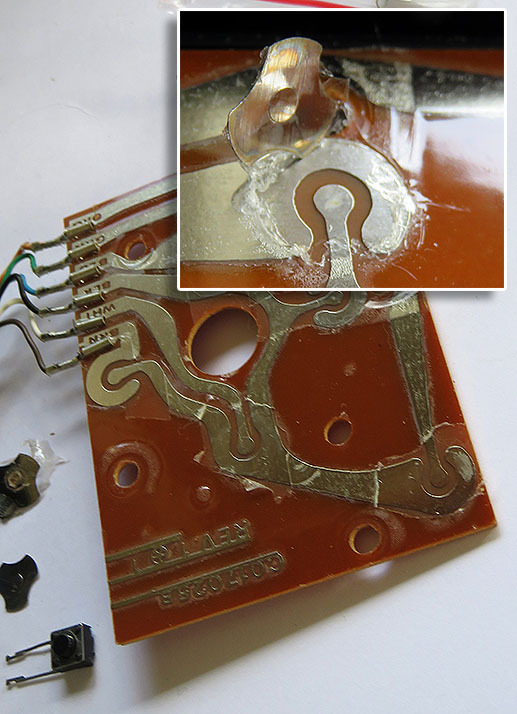 The original pads were around a millimeter high, but these new switches were 5 mm (about the same length as these pins). That mean't I had to cut those off - in fact, I had to make sure that they were 100% flat - even a small amount of plastic was too much. But it worked. The fire button was the same. I had to remove the pin in the center completely. 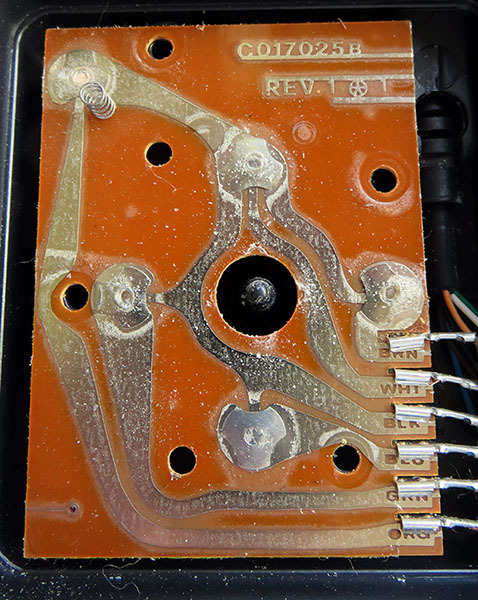 I also had to remove the spring which let it bounce back up, though this wasn't an issue given that the micro-switch has its own spring loaded button. And lastly - the switches had to be pretty accurate in where they sat on the PCB. I found the down switch was just slightly off, and that meant the joystick shaft was on one side of the button rather then directly above it. The space was pretty small, but just enough to not press down on the switch properly. A little heat and a tap with a screw driver and it was fixed. I managed to reassemble the stick. Moving it around has a nice click to it and feels great. If anything, down sounds like it may be not quite returning back to center, but its not hard to fix later. I'm thinking if necessary, I might buy some fairly small springs (or remove some from a couple of ball-point pens) to sit around each switch just for the extra 'bounce' but we'll see how she goes with River Raid. Roll on River Raid! Woo! FYI - tested the stick with Stella on a PC (still to get that console out again). Its really responsive - the 'Down' is just fine (and doesn't stick) and I can't wait to get River Raid up and running hopefully later tonight. 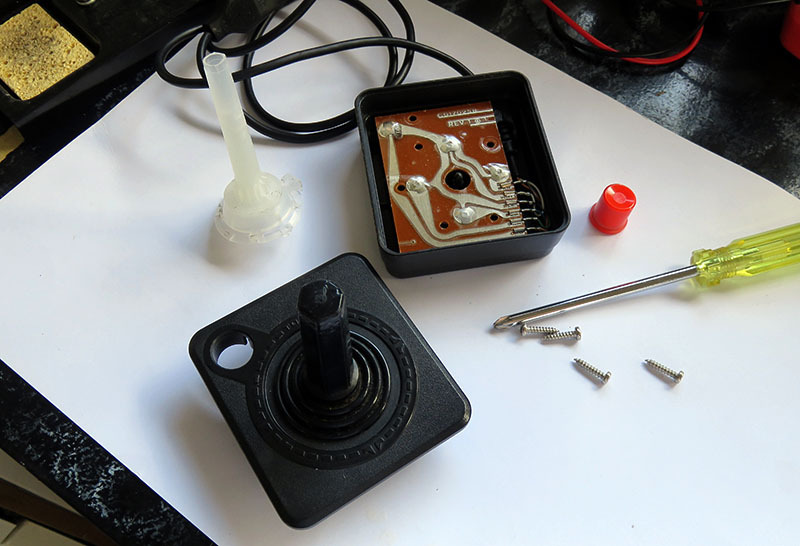 This modification/repair is well worth considering if you have any old joystick that is not 'quite' working. Many cheap joysticks of that era used the same simple metallic 'clicker' tech. Create retro-style text in illustrator.